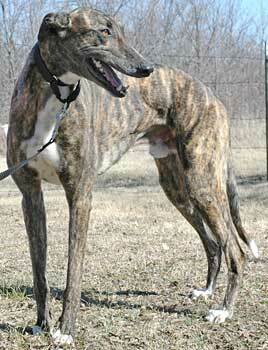 Sly, aka Mnj Sly, is a handsome 3½-year-old dark brindle male born on May 30, 2002. Sly's sire is Mankato, his dam is NXS Sweet Breeze, and his grand sire is HB Commander, a member of the NGA Hall of Fame. 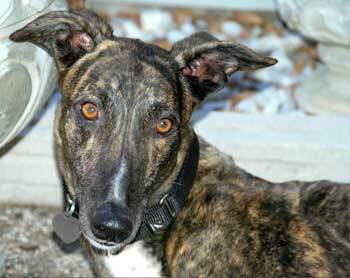 Sly started racing at the Gulf Greyhound Park in LaMarque, Texas before heading to Florida as a competitor at the Tampa and Derby tracks. 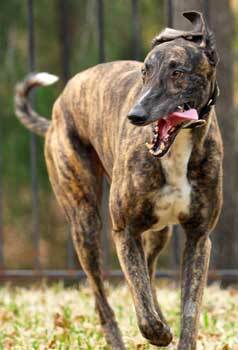 A pulled muscle ended Sly's career after 73 races, and his breeder/owner decided it was time for Sly to retire. Sly agreed, and this big friendly guy is now eagerly looking forward to meeting his new family. Sly is cat tolerant.